Caterham has been toying with the idea of diversifying its car portfolio to possibly include something like a crossover, because making cars for Simon Cowell just doesn't pay the bills these days. 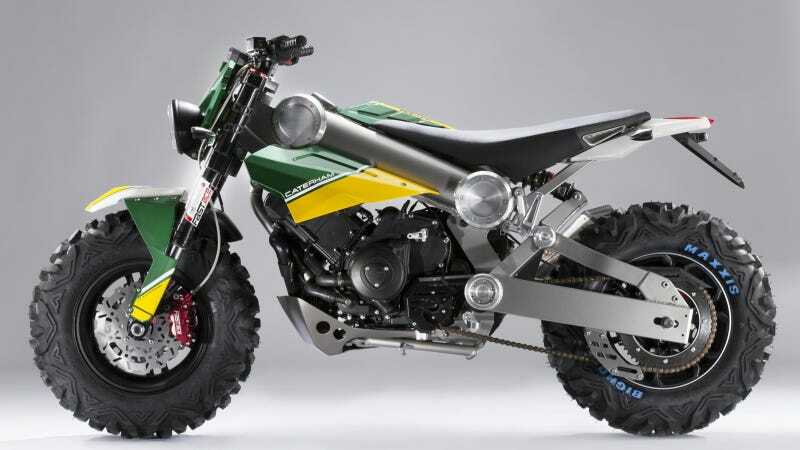 Which is why they've decided to start the Caterham Bikes division and proclaim they've invented the first-ever two-wheel SUV. Whatever that is. This is the Caterham Brutus 750, it goes on sale next year and will be shown this week in Milan. They say it's the first motorcycle with an automatic transmission and that it can "operate as a street bike, off-road machine or even a snowmobile." With a caveat that converting modes takes less than four hours. OK.
Just like some mainstream auto names, Caterham is also launching a series of electric bicycles. The Classic E-Bike does the job of "carrying uniquely retro styling for the rider with a penchant for a design harking back to the golden age of British motorcycling," or so they say. Then there's the Carbon E-Bike, which is inspired by F1 somehow. Carbon... fiber? That's probably it. All will be "priced affordably" when they go on sale sometime next year. Hey, we're just happy they didn't announce a Caterham SUV today. More info and photos in the press release.